Need I say, finally? The long-awaited mobile booking service on emirates.com is now live. 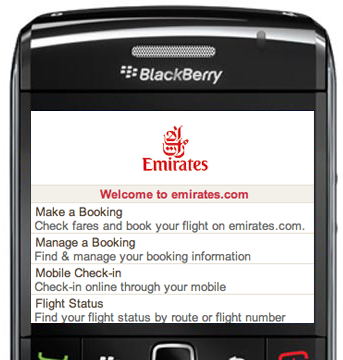 Emirates claims that the website is designed to work with more than 3,000 mobile devices and that they’ve ensured that the website is downloaded in the appropriate format for each specific mobile device, allowing customers to perform a multitude of tasks including booking and managing a flight, mobile check-in, searching flight schedules and status and checking the in-flight amenities available on a specific flight. What does this mean? Powered by Usablenet, the same company responsible for developing mobile sites for the likes of Dell, Expedia and Victoria’s Secret (I had to mention the latter), the homepage is clean plain text (apart from the EK logo) and is quite fast to load, even on EDGE networks, at 16KB for the homepage. If you can’t be bothered to reach out for your phone to see how it works, here’s a workaround, go to emirates.com/mobile and check it out. You won’t be disappointed. Very useable and very friendly, well done Emirates! I still want wifi on board, come on guys!